Mod The Sims - Five Spooky Day/Halloween Cards For Use With MoghHughson's Postal System. I had intended to take part in Simblreen this year over on Tumblr, but sadly I didn't have time to make enough gifts, so here is the one that I did manage to finish, just in time for (the latter part of) Halloween! :-) It fits into the current tri-monthly theme, Seasons & Celebrations, so I have tagged it accordingly. So, anyway, here are five greetings cards for use with MogHughson's Postal System. If you download these cards along with MogHughson's Postal System, then your sims will be able to send these cards to their friends, relatives and acquaintances in the neighbourhood. Sims who receive these cards will receive a small positive boost to their friendship level with the sender. There are two sets of cards, one of which is for Halloween and the other of which is for Spooky Day (which is featured on Phaenoh's calendars, like this one). The two sets share the same GUID's, so you can only have one set in your game! The pictures on the cards are identical, but the greetings message that pops up when your sim reads the card is different depending on the set: in the Halloween set it reads "Happy Halloween! Wishing You All The Best On Halloween!" and in the Spooky Day set it reads "Happy Spooky Day! Wishing You All The Best On Spooky Day!". All of the package files are numbered/named according to the above picture, so you can delete any of the cards that you don't want in your game. I also need to mention that I no longer have any registered GUID's, so these are made with randomly generated GUID's and may unintentionally replace something in your game! The likelihood of that being the case is very very small, as I understand it, but please let me know if you think that you've found that one of the cards may be replacing something (be it EAxis or custom content) and I will check it out and change the GUID('s) if neccesary. Many many thanks, as always, to MogHughson, for not just creating and sharing her Postal System but for providing templates and detailed instructions to allow people to create their own greetings cards! :-) I do love making them! 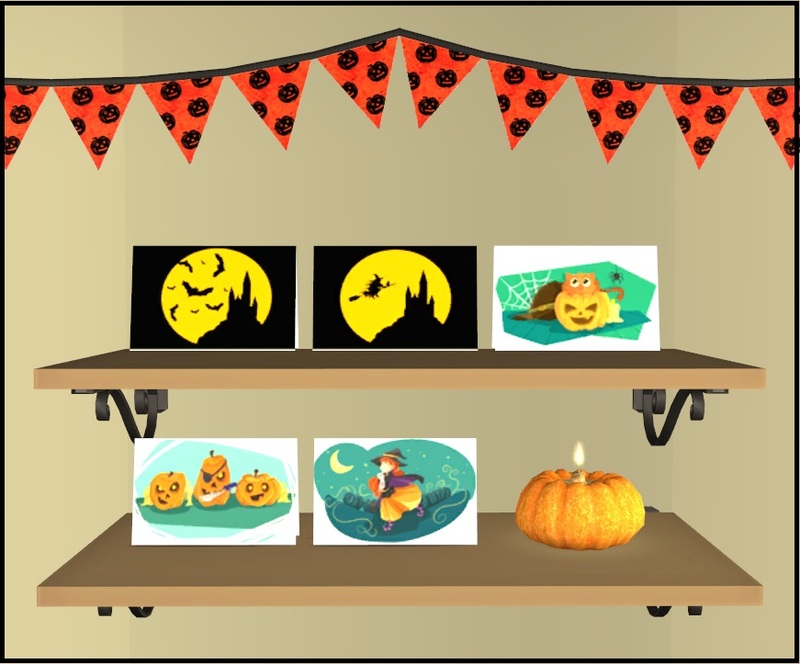 Thank you to Honeywell, Biffy Sims & Pocci for the shelves and Halloween decorations shown in the main picture, and to Ekrubynaffit for reuploading Pocci's Autumn Dining Set now that BPS has closed.